Over the past eight years, the most dangerous months for farm deaths in Ireland have been May, June and July. SINCE 2010, THERE have been 191 farm deaths in Ireland and the highest number occurred in July. In that time, the most dangerous months for farm deaths in Ireland have been May (20), June (20) and July (28). March and April had the lowest number of farm deaths in the past eight years, with 11 deaths reported for each month. In terms of area, Cork had by far the highest number of farm deaths at 31, the next was Tipperary with 14 and Wexford with 13. Sligo, Louth and Dublin had one farm death each over the past eight years. 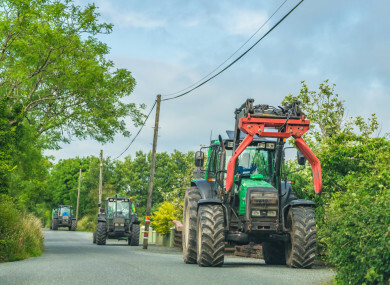 A spokesperson for the Health and Safety Authority (HSA) told TheJournal.ie that summer can be particularly dangerous with children and others visiting farms. However he noted that while there is less happening on a farm during winter it can also be a very dangerous time and serious accidents occur on farms 12 months of the year. He also added that some counties have higher numbers of farm fatalities due to the density of farming taking place and noted that dairy farms would be considered the most hazardous. The number of farm deaths decreased from 2010 (25) year on year until 2013 (16). However it almost doubled in 2014 to 30. After a drop the following year (2015) to 19, the number then started to steadily increase again in 2016 (21) and 2017 (24). Overall, there have been 13 deaths so far this year up until 10 July. For a larger image of this table, click here. It is possible to farm safely, accidents do not have to be part of farming life. Email “Farm deaths: Cork most fatal county and July most dangerous month”. Feedback on “Farm deaths: Cork most fatal county and July most dangerous month”.